Safe drinking water on the go. Game changing Titanium personal water filters. Guaranteed for life. 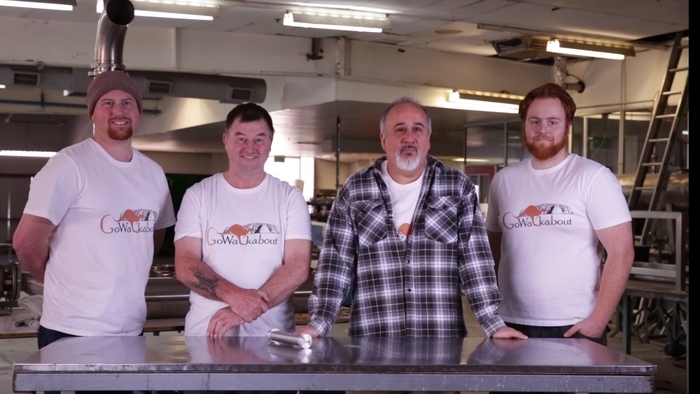 When the team at Go Walkabout approached us to film a video production in Adelaide for the world’s first titanium water filter, we just knew straight away that we had to get involved and help them with their Kickstarter campaign. Our brief was to create a video that not only showed the product, but also inspire, motivate and captivate an audience that can kindly donate to the campaign so the team at Go Walkabout can produce and supply family – and village-sized filters to help provide communities in developing countries with safe drinking water, through both donation and sustainable microcredit plans. The video consisted of a two day shoot in the factory plant at Advanced Metallurgical Solutions located in Lonsdale, South Australia. We felt that the factory was the perfect opportunity to show the audience where Matt, Craig, Josh and Gilbert invented the titanium water filter. There was a discussion about super-imposing the boys over a green screen and adding some fancy digital effects, but when we thought about it we realised that investors want to see these talented team in their natural surroundings, a place that is honest and real. Editing consisted of one day to meet the short timeframe of under 2 minutes on the final cut. We know from experience with other Kickstarter campaigns that you only have a couple of minutes to grab a potential investors attention. A little about the Walkabout Ti and Walkabout Ti Ultralight. Titanium – is used for jet engines, medical implants, mens titanium wedding rings and now personal water filtration. The Walkabout Ti and Walkabout Ti Ultralight are groundbreaking, world first titanium personal water filters. All other water filters are made of a hollow fiber plastic materials that can break or fail easily, but not titanium. Personal water filters are great, they can save you the hassle of carrying big water containers when you in the outdoors and avoid any risks of drinking tap or bottled water from unknown sources. They are also useful in the event of “boil water” advisories, which are becoming more and more common. They also help reduce the number of plastic bottles made and disposed of for bottled water. You have to be careful with personal water filters, you never really know when other water filters are going to fail. This can be dropping, freezing, sitting on and overheating. And often you don’t know if they have failed. You can be sure that titanium won’t fail. Walkabout Ti filters are an amazing and lightweight personal water filter that you can count on to give you safe drinking water when you go walkabout, or any other recreational activity. Support the Go Walkabout team by pledging a donation through Kickstarter by clicking here. Last Thursday 16th October saw the launch of the program for the 2015 Adelaide Festival. The 30th Adelaide Festival program was unveiled with the full line-up presented by Artistic Director David Sefton, and we had front row seats. This being our fourth year working with the Adelaide Festival we feel very privileged to be invited to the launch party, especially when we get a mention from CEO Karen Bryant in front off all government officials and the media at the VIP party before hand about our graphic design work. As a nod to the very first Adelaide Festival poster, the artwork for the 2015 Adelaide Festival of Arts is an interpretation of the iconic ‘double A’ from 1960. This was designed and developed by Voice. The 2015 Adelaide Festival features over 22 Australian premieres and exclusive events including the ambitious digital arts event Blinc, which will open the Festival on Friday 27th February 2015, and will continue every night of the festival for free. Artistic Director David Sefton says Blinc is the “most ambitious public art event the festival has ever presented”. Danny Elfman, will be in Adelaide for his production Danny Elfman’s Music from the Films of Tim Burton, which is a showcase of some of the memorable scores he has composed for famour director Tim Burton which includes Batman, Beetlejuice, The Nightmare Before Christmas and Edward Scissorhands. The concert will be held at the Entertainment Centre and will be performed by the Adelaide Symphony Orchestra. Other highlights of the program include Unsound, Tommy: which is a radical jazz reimagining of The Who’s double album, Fela! The Concert: A concert version of the Broadway musical about Afrobeat originator Fela Kuti, Blow the Bloody Doors Off!! : instrumentalist Terry Edwards celebrates the music of the iconic Michael Caine film such as Alfie, The Italian Job and Get Carter. Cedar Lake Contemporary Ballet: The US company makes their exclusive Australian debut and Bill Viola: The work of the American video artist will be presented across three venues, The Art Galley of SA, Queen’s Theatre and St Peter’s Cathedral. The social photos above in the slider were taken by Tony Lewis and you can see more by clicking here at Indaily’s website. BankSA has gotten rid of its well known Sturt Desert Pea identity for a new logo upgrade, which incorporates a map of South Australia. The former, well known logo is gone now for bold letters and a stylised outline of the state as one of the state’s oldest banks undergoes an a major upgrade. 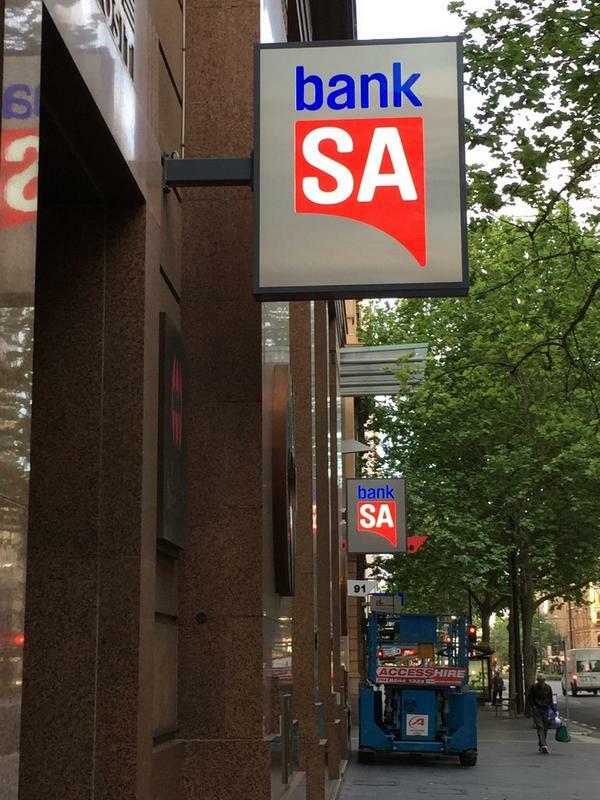 BankSA, which has roughly one in three South Australians as customers, yesterday revealed its new logo — as part of a modernisation plan. The bank said the change was one of the largest in its 166 year history and signals a broader transformation of its network and services. The bank is also closing a bunch of it’s branches such as Walkerville, Regency Park, Flinders Medical Centre, Queen Elizabeth Hospital, Hahndorf and more, which has angered some business and customers, but new branches will be opened at Munno Para and the new Churchill Shopping Centre in Kilburn in coming weeks. South Australians had helped shape the bank through patterns and feedback, said chief executive Nick Reade. The new look was developed by the BankSA Marketing team & Clemengers (Adelaide) and Saatchi & Saatchi. We personally feel what a wasted opportunity. Badly executed, poorly considered and with nothing that distinguishes it from a generic government department. What’s Next in Web Design Trends for South Australia? Back in March we looked at some of the design trends that would make waves for 2014. As we move past the halfway part of the year and look towards 2015, did we get it right? Here’s our web design report card and a preview of what’s coming next in 2015. In March, we said parallax scrolling would be popular. We were right, because web designers are making that effect do all sorts of great things. But many have gone even further, using scrolling effects to create columns that scroll separately, horizontal scrolling effects, infinite scrolling and more. Flat design was another trend we mentioned that seems destined to be around for a while. As designers work more with flat design, we’ve seen a couple of other related trends. For example, minimalist icons work well with flat design (and with mobile first design). The web is awash with minimalist icon sets and minimalist mobile designs. Check out an example in the footer of the re:create site. We were also right about card based layouts, which we have seen on social media and other sites. The proof is that Google has released new design guidelines (Material Design) which will be used to give all their products that layout. If Google‘s doing it, then you can be sure that design trend will be around a while longer. Web design trends are not just about adding but about taking away. One old favorite that’s on the way out is the slider, because there are better ways to get attention. One of those is the hero area (the large area under the top navigation bar). This has become an important place to put images – the bigger, the better – to send a clear message about your business. Here’s one example from Airbnb. Designers’ approach to type is changing. For a start, there’s a lot less text on pages, as companies use short videos to deliver the same message as a page of text. As we know, this keeps people on the site longer, so it’s probably a smart move. Where type is used, it’s got a bit more experimental, with web pages mixing sizes and fonts to good effect. Check out the Poppies Flowers site where the navigation labels look like they’ve been written in chalk on a piece of wood. Many of the web design trends come together in the one-page website. These often feature large images, easy navigation and focus on minimalism. They can let businesses tell their story in a simple way and keep the user experience great for mobile and web users. And they usually use responsive design. Here’s an example on the BeNumo site. These are the trends that will dominate the rest of 2014. What other web design trends have caught your eye? Go and visit http://www.trinetsolutions.com/ for more information. October 1, 2014 admin Web design Comments Off on What’s Next in Web Design Trends for South Australia?